Good Show Sir Comments: That’s not creases in the book cover… that’s barbed wire! Is a Screwtop what she’s wearing? Because that’s nowhere near as impressive as fun me shoes. (Bowdlerised version). The figures in the background make me think this might be taking place in the Matrix (no, not that one, the one that Jan Vincent-Rudzki hated). … and starring Stephanie Beacham as THE GLAM DOCTOR. 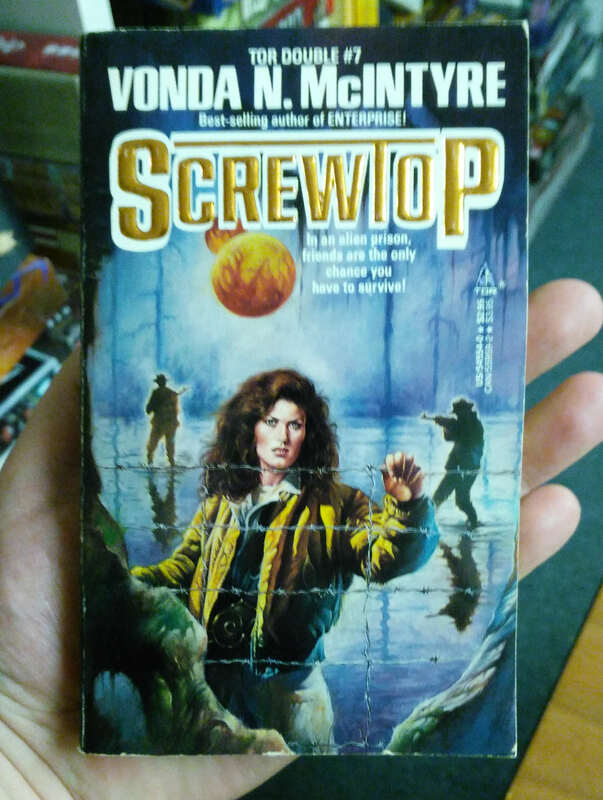 With a name like ‘Screwtop’, I naturally assumed it was about a screw-up at Carrot Top’s performance. Her hair is doing nothing to dispel that idea. In an alien prison, it’s hard to find product to maintain a Farrah Fawcett hairstyle. Two people who can walk on water, and one of them is murdering the other. The question is: which one is Jesus?!??? Well of course these two had to be paired together, unless there is a book out there named ‘Plastic Packaging You Can’t Open With High Explosives’. 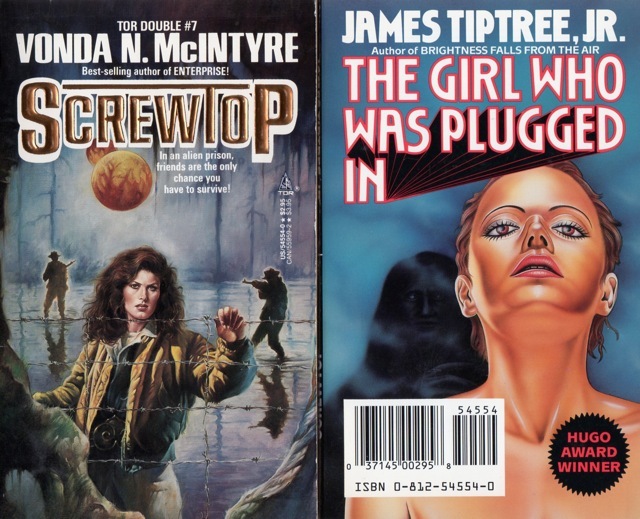 1) @DaveM – Are there other book in the series called Poptop, Vacuum Sealed Top? 2) You really shouldn’t pinch barbed wire like that. 3) Does a man about to shoot you/the other guy merit a BEHIND YOU! tag? Or is that not epic enough? The subtitle ‘The Double #7″ refers to the amount of Boots own-brand make-up she’s wearing. @ Perry A: I deny this reality! It’s actually what Paul McGann thought he looked like in that wig. What’s with the giant toy soldier figures in the background? I mean, seriously, how you could possibly have mistaken them for real people is beyond me. And, going by our lady friend’s extremely dated clothing and hairstyle, plus the rather ineffective barbed wire fence . . . this is an alien museum display. THAT’S why there’s an alien in the foreground! @HappyBookworm, Why yes. I believe the upcoming novels are “childproof top” and “easy refillable top”. Oh, and I quite agree you really shouldn’t squeeze barbed wire like that at all..
She’s obviously immune to barbed wire, so why doesn’t she just spread it out and duck between the strands? I learned how to do that as a kid, and without all the heavy clothing she’s wearing besides! Is she worried about her hairstyle? This is not a very escape-proof prison.